The less dramatic bombing of O’Connell’s tomb, June 1952. | Come Here To Me! The less dramatic bombing of O’Connell’s tomb, June 1952. In January 1971, Loyalist bombers from the Ulster Volunteer Force planted an explosion within the Daniel O’Connell tomb at Glasnevin Cemetery. This explosion caused significant damage to the stairwell of the impressive tomb, which removed one of the finest views of the city for many years. 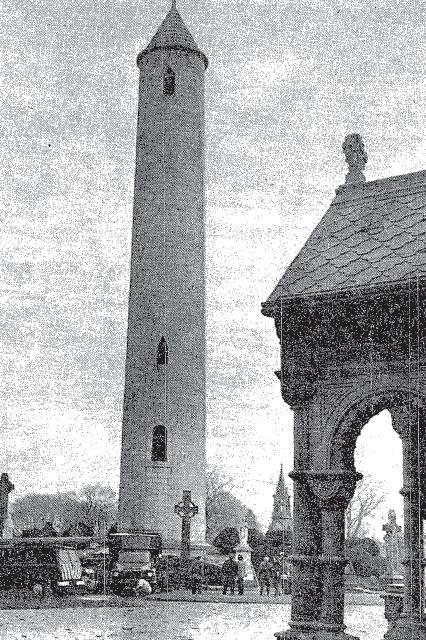 The windows and window frames of the tower were blown out by the explosion, and Gardaí kept a 24 hour watch on the monument for some time following the failed attempt at blowing it up. It was not the only important site to Irish nationalists which would be bombed by Ulster Loyalists. The final resting place of Protestant Republican Theobald Wolfe Tone was also bombed by Loyalists, as was the Daniel O’Connell monument on O’Connell Street. This was not the first time the O’Connell tomb was damaged by bombers. In 1952, A Dublin schoolboy prank had seen an explosion in the famous Glasnevin Tower grab national media attention, and indeed a 15-year-old was dragged through the Children’s Court. On June 6th 1952, an explosion inside the Tower baffled authorities at first. The explosion damaged the windows of the tower, and the Irish Independent reported the following day that a “home-made bomb is thought to have been used.” Three boys were quickly arrested, one of whom was brought before the courts. At 8.30pm on June 6th, the youngster climbed the O’Connell Tower, planting his crude explosion on the top storey with a lighted candle. When asked why he had done it, the lad remarked that “because it was so high”, he expected “a lot of noise and a big flash.” Unlike the bombing which would follow in 1971 then, this one was motivated mainly by boyhood boredom and curiosity! A punishment of 12 months probation was handed down. I see you have also retailed the formula for gunpowder. Does Ecuador have an embassy in this town? I have my suspicions that what really brought down the stairwell was Daniel O’Connell spinning in his grave at the thought of a monument to armed republicanism right next to him, in the cemetery he founded. It’s a shame that no-one thought to replace the stairway in the last 40 years, not even when we were spending money on enormous digital clocks just for a laugh. on June 15, 2016 at 2:17 pm | Reply Eamonn Cooke archive mentions – shootings, threats and firebomb attacks | Come Here To Me!